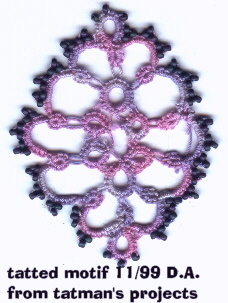 I made this tatted Motif using #20 Manuela in a varigated blue and pink. I used the instructions from one of Tatman's Project of the month patterns. I used 11/o JSB's in a 463a that is a Matte finish bluish purple.